HONG KONG 1937 George VI Coronation Cover Collection Three (3) Different Cacheted First Day Covers Each with the Complete Set of Three (3) Stamps Scott #151-153, S. HONG KONG (May 12, 1937). 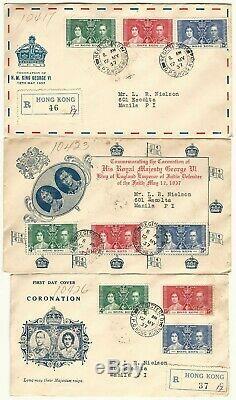 Three different 1937 Hong Kong Coronation First Day Covers, each with a complete set of three. Each cover has a different illustrated cachet. On back of each cover is a 1 cent stamp to make up the 45 cent International Registered rate. 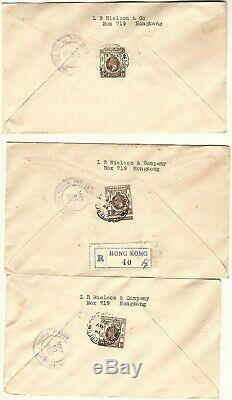 The covers were mailed from Hong Kong on May 12, 1937 and have arrival cancellations of May 21, 1937 in Manila, Philippines. These first day covers come from a recently rediscovered cover collection that was put away in 1986 after years of its development. The scans are of the actual items being offered in this lot. The item "3 x Hong Kong 1937 Coronation Set First Day Covers, Different Cachet for Each" is in sale since Sunday, April 7, 2019. This item is in the category "Stamps\British Colonies & Territories\Hong Kong (until 1997)". The seller is "abctoo" and is located in Oakland, California. This item can be shipped worldwide.